terrorists attacked and destroyed the World Trade Center in New York City. knowing we can never forget the past. Location. 40° 40.57′ N, 74° 17.347′ W. Marker is in Kenilworth, New Jersey, in Union County. Marker is on Boulevard (County Route 509), on the right when traveling east. Touch for map. Marker is located in front of the Kenilworth Municipal Building. 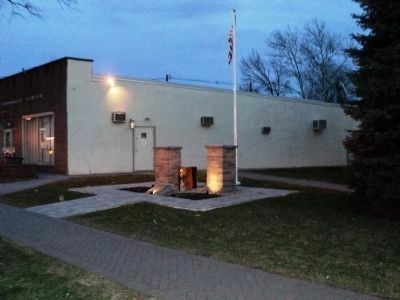 Marker is in this post office area: Kenilworth NJ 07033, United States of America. Touch for directions. (approx. 1.4 miles away); Battle of Connecticut Farms (approx. 1.4 miles away); First Presbyterian Church of Connecticut Farms (approx. 1.4 miles away); Caldwell’s Home (approx. 1.4 miles away); Caldwell Parsonage (approx. 1.4 miles away); Site of Crane’s Ford (approx. 1.4 miles away). More. 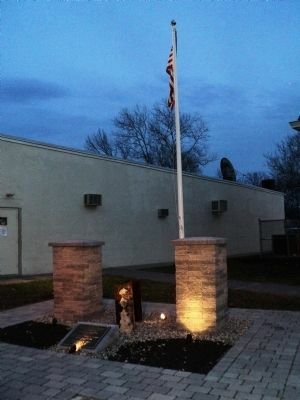 Search the internet for Kenilworth 9/11 Memorial. Credits. This page was last revised on June 16, 2016. This page originally submitted on March 8, 2012, by Bill Coughlin of North Arlington, New Jersey. This page has been viewed 415 times since then and 7 times this year. Photos: 1, 2, 3. submitted on March 8, 2012, by Bill Coughlin of North Arlington, New Jersey.